In the first four months of this year, we found ourselves mourning the loss of three significant contributors to EARTH: Mr. Jorge Manuel Dengo, EARTH founder and emeritus Board member; Mr. Freddy Burgoa, member of the EARTH University Board of Directors; and most recently Mr. Martin Gatins, member of the EARTH University Foundation Board of Trustees. These men, along with our two Emeriti board members who died in 2011—Mr. Hernán Fonseca and Mr. Rodolfo Cortés—were never paid for their service and yet they gave so much of themselves to EARTH. Their passing gives us cause to take a moment to recognize this great loss and the legacy that these men have left. How fortunate we are to have had these brilliant people who made EARTH possible! Truly the greatest honor we can pay them is to strive to make EARTH the best it can be, and to expand our impact around the world. I recently participated in a discussion group at the second annual Forum on Sustainability and Happiness, a conference that reflects a growing movement to include happiness as a metric for assessing the progress and sustainability of nations. At the core of this movement is a well-researched conclusion that happiness has much more to do with the quality of our human relationships than with our income or material possessions. With this in mind, I invite us all to reflect on what is important in life—on our human relationships and connections with one another—and how these great men have left an immense legacy that is beyond material value and beyond material value. The passing of these gentlemen, in addition to that of our alumnus Juan Guillermo Porras (’96, Costa Rica), who also recently died in a car accident in front of his alma mater´s gates, are overwhelming to us. We can however honor their memory by striving to be better human beings—to care for each other, to love one another and to strive for a world where we all live in peace, harmony and with justice. Every Monday evening at EARTH, a student performance group gathers to share a passion for drumming and dance. What happens when these artists from Haiti, Nigeria, Costa Rica, Sierra Leone, Guatemala and other nations meet? An exciting synthesis. The students’ rhythms mirror the mosaic of cultures interacting on campus and invite the audience (when present) to join the circle. The group began meeting this spring, and it first performed in March at EARTH’s anniversary celebration. Then, at the end of April, the students offered their first off-campus presentation at CATIE, a graduate-level research university in agriculture located in Turrialba. their capacity to make positive change by working together. And rather than viewing their cultural differences as a challenge, Student Council vice president Ana Patricia Calel Herrera (’14, Guatemala) comments that the students’ many backgrounds help them to find more ways to solve problems. Although the Council mainly focuses on addressing practical issues related to student services, later this year its leaders plan to organize a fashion show of clothing made from recycled materials, encouraging students to express their creativity. “It is so wonderful to have these kinds of gatherings,” comments France Gina Beauzil (’14, Haiti), who dances in the group. She says that the rehearsals have given her a space to have fun, “express joy,” discover drumming’s connection with agriculture, and best of all, she says, “to learn from other people.” She describes the experience of participating in the group as transformative, holistically rejuvenating her each evening she attends. France Gina also feels that it has changed her in a larger sense: through the friendships she has made, she has already gained a much more personal knowledge of the many countries from which EARTH students come. This March, EARTH’s on-campus community enjoyed another international arts event at the first student-organized Cultural Evening. With the support of the Student Affairs Office, the student group Unity organized its peers in a showcase of the traditional foods, music and dances of their countries of origin. Culinary offerings included Johnny cakes from Belize and a milk tart from South Africa. There were street and folk dances, and even though many students had learned the dances growing up, co-organizer Juan Gabriel Romero Cervones (’12, Ecuador) commented that some students expanded their knowledge of their own countries by learning a dance from a region other than the one where they grew up. 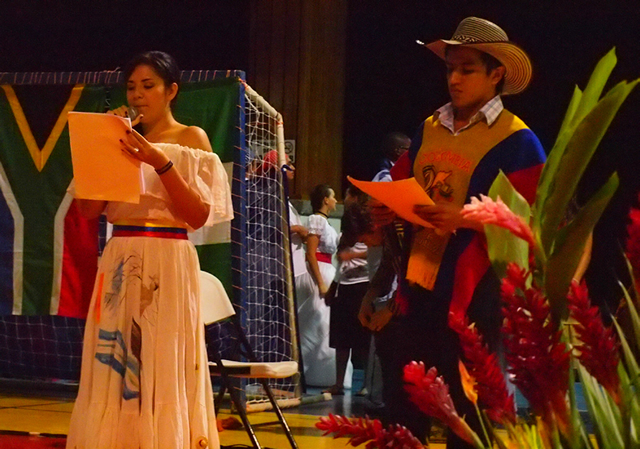 Juan Gabriel and co-organizer Jenny Nataly Dagua (’14, Colombia) explain that the event aimed to bring students together to celebrate their “great cultural richness.” Unity looks forward to hosting more events this year to share the diversity present in the EARTH community. With the retirement of Professor Ricardo Russo in 2011, in January 2012 EARTH welcomed to its faculty new Forestry professor, German Obando. Obando, of Costa Rican nationality, holds an M.S. from CATIE in the Integrated Management of Natural Resources with an emphasis on the management and silviculture of tropical forests. He has extensive consulting and research experience in Costa Rica, Brazil and Peru, and was most recently the Science and Technology Director of FUNDECOR, a non-governmental organization dedicated to protecting and developing the forests located in Costa Rica’s Central Volcanic Mountain Range. In addition to research and community development responsibilities at EARTH, Obando is teaching the third-year Tropical Silviculture course. Thanks to an $80,000 donation from the U.S. State Department’s Central American Energy and Environmental Security Initiative (EESI), and technical advice and support from the Costa Rican Electricity Institute (ICE), in February EARTH inaugurated an innovative smart grid at the University’s EARTH-La Flor campus at the Daniel Oduber Center in Guanacaste. This smart energy grid generates information about energy consumption and transmission, efficiency of the equipment, and energy quality monitoring, and allows for the remote control of both generation and consumption. Several neighboring companies were included in the project, including Ad Astra Rocket, the Daniel Oduber Quirós International Airport, the Liberia Municipality, and the Guanacaste Conservation Area, in order to demonstrate the smart grid´s viability and operation. In February, EARTH hosted the winners of the “Become an EARTH Student for a Week” contest conducted with Whole Foods Market in September 2011. The contest, which generated more than 8,800 new subscribers to our newsletter, gave four Whole Foods Market shoppers the opportunity to learn about sustainable agriculture and community development in the tropics. Two bloggers, Max Goldberg of Living Maxwell and April Gilbert of green LA girl, and one reporter, Alyce Lomax of the Motley Fool/AOL Daily Finance, joined the trip, resulting in eight blog posts and news articles. Sergio Salazar (’05, Colombia) and Eduardo Asturias (’07, Guatemala) were roommates at EARTH for two years, resulting in a strong friendship that has transcended distance and resulted in shared dreams. After graduating from EARTH, Sergio returned to his hometown, Manizales in the department of Caldas, Colombia. He founded Pro Amb, a company that generates models for clean environmental development, along with another EARTH graduate, Daniel Villegas (’04, Colombia). For his part, Eduardo returned to Guatemala City, where he started working in the private sector. In spite of successful careers, their education at EARTH had also instilled in them a deep social commitment, and both wanted to make a more direct impact to improve the conditions in their countries. As a result, in 2008 Eduardo founded Alternative Rural Development (DAR, in Spanish) with other young Guatemalans to implement sustainable and holistic projects to improve the quality of life in the rural and peri-urban areas of Guatemala. Among its achievements, the association has installed 61 bio-digesters in rural areas and has received two awards, one granted by the Ford Foundation and the other by the Energy and Environmental Alliance. When Eduardo started telling Sergio about DAR, they discussed the possibility of partnering in Colombia. They knew that together, they could grow faster. “The idea is to bring more people into this and work under the same motto. In this way we can have more funds and make a bigger impact. I believe that if all EARTH alumni join together, we could build the biggest association in the world,” commented Eduardo. At the present time, the establishment of DAR in Colombia is in progress. The statutes have been signed and the administrative processes are being finalized. For Sergio and Eduardo, the bond they formed at EARTH is the foundation for their collaboration today. “We developed a level of trust beyond what is normal, we got to a point where the goal was more important than the circumstances. It is sharing the dreams of the other person and trying to make them come true,” explained Sergio. George Todd came to EARTH University for the first time nearly 20 years ago, spending three days on the campus at the invitation of the W.K. Kellogg Foundation. The partnership began with a brief visit, but it has blossomed over the two decades since then. He speaks with enthusiasm of hosting the nineteenth EARTH intern at Kalsec, Inc. this year. Since it began, the internship program has truly opened doors for the EARTH students who have participated. In fact, for former intern Gustavo Puente (’02, Ecuador) the program has come full circle: he now works as Global Purchasing Director for the company and last year hosted EARTH intern Fernando Alvarado (’12, Costa Rica) during his stay at the company. Furthermore, Gustavo has kept in touch with the network of EARTH interns. His connections with them have facilitated Kalsec, Inc.’s collaboration with EARTH on several projects in Latin America “to improve the quality, sustainability and reliability of some of our raw materials while at the same time giving students the opportunity to work within a business setting where they can make the connection between their education and the economies of the communities where they work.” In these ways, the international partnership has strengthened, enabling both the University and Kalsec, Inc., to benefit communities in more meaningful ways. On International Women’s Day, the Ministry of Agriculture of Costa Rica recognized EARTH alumna Hortensia Solís Agüero (’06, Costa Rica) for her contributions to agriculture, especially the coffee sector. After graduating from EARTH, Hortensia returned to her hometown of Dota, located in the south-central mountains of Costa Rica. There she assumed leadership of the Sustainability Department at the Coopedota coffee growers’ cooperative, the producer of Allegro Coffee, which has partnered with EARTH to offer the EARTH University Costa Rican blend available at Whole Foods Market. During her five years at Dota, Hortensia successfully implemented a variety of projects, including achieving the first carbon-neutral certification for coffee in the world. Currently, she works in The Hague, Netherlands, and in July will begin a research fellowship awarded by the Alexander von Humboldt Foundation in Germany to develop a measurement, reporting and verification system for coffee producers in Costa Rica. The annual Tropical America Fair will be held this year on June 30 and July 1 under the theme: “Uniting cultures for change.” With an annual attendance of approximately 10,000 people, the fair generates needed resources to ensure that all graduating students can bring at least one family member to their commencement ceremony.